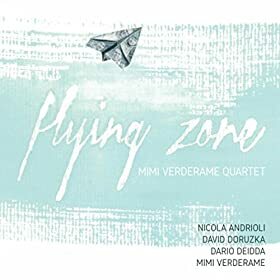 The video above presents Flying Zone, a new CD (his fifth as leader) from Liege-based drummer Mimi (short for Domenico) Verderame, a pivotal figure on the Belgian scene. . "With a musical career spanning over three decades, and a CV with references ranging from Jacques Pelzer to Toots Thielemans and Philip Catherine, drummer Mimi Verderame can be described without hesitation as a little monument of Belgian jazz." (Joachim Ceulemans, Jazzaround). His quartet includes fine, melodic, Italian pianist Nicola Andrioli who caught my ear on his UK debut (REVIEW) and who plays regularly with Belgian/British guitar legend Philip Catherine. The other quartet members are Czech guitarist David Dorůžka and Italian bassist Dario Deidda. A trivia point for the visually minded is that the drummer's surname is derived from the Italian word for the pigment verdigris, as used by Vermeer, for example, and the new album artwork uses only that colour.